Back in the days of prohibition, families often made refreshing drinks to take to the fields and to enjoy at family picnics, church socials, and parties. They also loved to sip such drinks while relaxing on the verandah on warm summer evenings after the daily chores were done. Make tea in usual fashion except that you add two whole cloves to each cup of tea before brewing. Strain, and while still hot add sugar and lemon to taste. Pour through cheese-cloth. Before serving put in each glass crushed ice, two or three sprigs of mint, which should be slightly bruised, and a maraschino cherry, and also a very thin slice of lemon with rind left on. 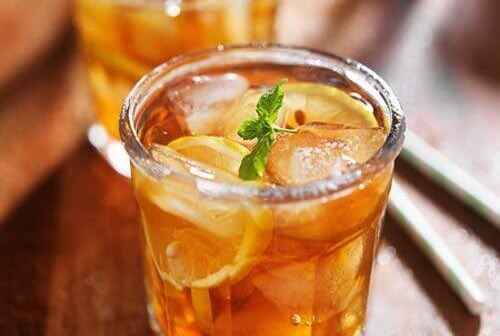 The old fashioned non alcoholic drink recipes make beverages that are delicious and very refreshing. They are great for taking on picnics and for serving to friends and family. Stick cinnamon, 1 inch; blanched almonds, 1/4 pound; rich milk or light cream, 1 quart; rose water, 1 tablespoonful; sugar to taste. Crunch cinnamon stick and almonds with a rolling pin. Add to milk or cream. Sweeten to taste. Place in top of double boiler and bring slowly to boiling point; strain through a fine sieve. Chill and serve in small cups or tumblers as an afternoon beverage. Deep Southerners still favor this old Colonial beverage. Cocoa, 3 tablespoonfuls; sugar, 1/3 cup; boiling water, 3 tablespoonfuls; chilled milk, 6 cups; peppermint extract, 1/2 teaspoonful; 6 mint sprigs. Blend cocoa and sugar together; add boiling water, and stir until smooth. Add milk and extract; beat until well blended. Pour into glasses and garnish with mint leaves. A favorite with youngsters of all ages. Almonds, 1 pound; sugar, 1 cup; boiling water, 2 quarts; almond flavoring, 2 tablespoonfuls. Blanch almonds in boiling water, and remove skins. Allow to dry thoroughly and pound until fine in mortar, a few at a time, or grind fine in nut grinder. Combine almonds, sugar, and water. Bring to boiling point and simmer 20 to 30 minutes. Strain into pitcher and cool. Stir in almond flavoring. Cover and chill thoroughly. Makes 2 quarts. Dilute with water to taste, and serve chilled. Add brandy if desired. Mexico, Europe, and the Middle East all claim this delicious milk, but its origins are so ancient that the dispute will likely never be solved. Simply enjoy it! These non alcoholic drink recipes are very easy to make, and the drinks are deliciously refreshing. One quart strawberries (fully ripe), 1 lemon, 1 orange, 3 pints water, 1 pound sifted sugar; mash the strawberries through a sieve; add juice of lemon and orange and the water, and work together; let stand 2 hours; put the sugar into a bowl and strain the juice over it, stirring till sugar is dissolved; stand on ice before serving; a delicious drink. Boil in 3 pints water 6 or 8 green stalks rhubarb and 4 ounces raisins or figs; when the water has boiled 1/2 hour, strain and mix it with 1 teaspoonful rose water, and orange or lemon syrup to taste. Drink it cold. 4 pomegranates, 1/2 pound of pounded loaf sugar, 1 pint of water, the juice of 2 limes. Put the red pips of the fruit into a basin with the sugar, bruise all together, pour over the water, then the lime juice, and strain several times through muslin. A good orange, a few drops of essence of cloves, ditto peppermint, 3 or 4 lumps of sugar, a tumblerful of ice. Fresh lime, ice water, loaf sugar, a little liqueur. Squeeze the juice from the limes, strain it, and add pounded sugar to taste, and a little flavoring of liqueur, if liked. Put a little of this mixture in a glass, and fill up with water. All the cups, such as champagne and claret cup, are improved by the introduction of slices of fresh fruit, such as apricots or pineapple. One pound of raisins, 3 lemons, 2 pounds of loaf sugar, 2 gallons of boiling water. Cut the peel of the lemon very thin, pour upon it the boiling water, and, when cool, add the strained juice of the lemons, the sugar, and the raisins, stoned and chopped very fine. Let it stand for a few hours, stir, then strain it through a jelly bag and bottle it for present use. Take 3 pounds of soft sugar dissolved in 1 quart of water, whites of 3 eggs beaten stiff, 1-1/2 ounces of tartaric acid, dissolved in 3/4 of a pint of water, and flavor with oil of lemon. —Sister Jennie Brown, Whitewater, Ind. The juice of grapes, blackberries, raspberries, etc., pressed out without mashing the seeds, adding water, 1 pint, and sugar, 1/2 pound for each pint of the juice; then boil a few minutes, skimming if any sediment or scum rises, and bottling while hot, corking tightly, cutting off the corks, and dipping the tops into wax, and keeping in a dry, cool place, gives a wine that no one would object to, if iced when drank.